Writing paragraphs doesn't have to be hard. This paragraph writing program is both fun and effective. In addition to the printable writing prompts, graphic organizers, and rubrics, you will also get access to digital, paperless Google Drive slides to use with Google Classroom and other digital platforms. You can use this as a Paragraph of the Week program, at a literacy center, as homework, or in whatever way works for your classroom. 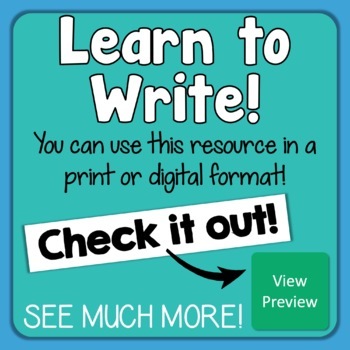 Please download the FREE PREVIEW for a detailed look at both versions plus a link to 3 FREE Google Slide Writing Prompts so you can try before you buy. There are 20 numbered prompts for each of the paragraph types (60 total): Opinion, Informative, and Narrative. 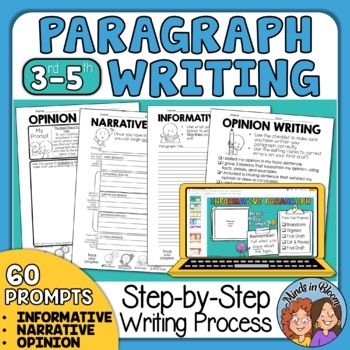 In addition to the prompt, each sheet includes helpful information for writing that type of paragraph, room for brainstorming, and a checklist to track each step of the writing process. There is also a page for each of the 3 types of writing with empty prompt boxes so that you can make your own. This allows you to create prompts for topics relevant to your class, such as field trips, social issues, school events etc. There is one organizing page for each of the three types of paragraphs. 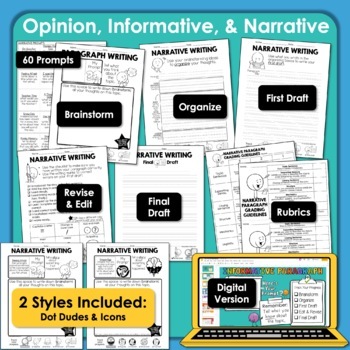 These sheets guide students through the process of taking the ideas from their brainstorming and organizing them into the elements they will need to write the paragraph. Each sheet features instructions unique to that particular type of paragraph. If you do not wish to use such specific terminology, there is also a more generic format with checkboxes for students to indicate the type of paragraph they are writing. Again, there is one sheet for each of the three types of writing, as well as a more general format. In addition to space for writing the paragraph, there is also an editing marks guide to use while editing and revising. In the digital version, the editing marks have been replaced with a list of revising and editing reminders. With the organization step and first draft on one sheet, this format will work well when your students are ready for less structure. Again, there is one page for each type of writing, as well as a more general format. Several options are given for the final draft. There is one for each of the three types of writing that includes a “Did you…” checklist to help students stay on track. The checklists are also offered separately, printed three per page. There are also formats that can be used with any of the three paragraph types that allow for illustrations, whole-page and half-page layouts. Use the one that works best for your students. Students using the digital version can illustrate using paint programs, photos and gifs from the internet, downloaded photos, scanned drawings etc. Two types of rubrics are offered for each of the three types of paragraphs. The first is a detailed, whole-page grid. The second is a less formal, half-page format that allows you to use whatever system works for you. Again, a more general rubric is also included. In addition, there is a poster listing several dozen linking/transition words and phrases for easy reference. -Use as for Paragraph of the Week – either in class or as homework. There are more than enough prompts for the year, so you can pick the ones that work best for your students. 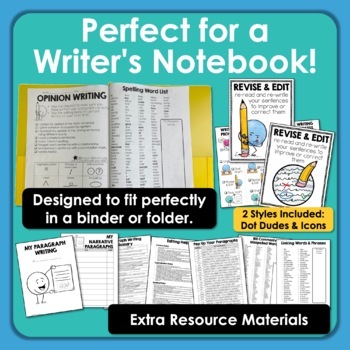 -Give each student a Paragraph Writing folder or binder section. Allow students to select their own prompts and pace themselves, gathering materials as needed. Require a specific number of paragraphs be completed per month or quarter. -Create a Paragraph Writing Center – Provide all the pages needed and swap out prompts each week. Students can use the center throughout the week as part of their literacy block. -As students become more proficient at writing paragraphs, consider using notebook paper or computers for the steps that follow brainstorming. You might also skip the organizing step at this point and go directly from brainstorming to first draft. -When your students are ready, consider expanding some of the prompts into 3-5 paragraph essays. Need this product for younger students? Try I Heart Paragraph Writing Grades 1-2. Need this product for older students? Try I Heart Paragraph Writing Grades 6-8. ♥ I have a few other Paragraph of the Week products, yet this is my favorite and is laid out so nicely that I'll have my students writing perfect paragraphs in no time! -Stephanie Ann. ♥ My students immediately loved the opportunity to break down their writing in a visual and easy to understand way. -Grace N.
♥ This resource is amazing! I love it and my kids (2nd graders -- above, on, and below grade level) enjoy it so much. My lowest reading group actually looks forward to writing their weekly paragraphs because this resource has helped me become SUCH A BETTER writing teacher. Thank you for offering this resource!!! -Jennifer NunezWard. ♥ This saves me so much time and also helps my students know what to expect during writing workshop. The routine really helps us all simplify some of the writing concepts and build habits of really great writers! -Mary B. ♥ Love that this is in both print and digital form. I was able to use it the very next day with my students (even without Google Classroom experience). -Shavon Y. The student guides (instructions on organization sheet, Did You checklist etc.) and grading rubrics were designed to align with the English Language Arts Writing Common Core Standards for grades 3-5. All of the writing standards relevant to paragraph writing are addressed in this resource. In some cases students must write pieces longer than a paragraph to fully meet the standard. Even in these cases, this resource will help to build a solid foundation for more advanced skills. This resource will also work well for teachers who are not using the Common Core Standards.